Whether it be red lipstick, red eyeshadow, red blush, red nail polish, red colored clothing, red shoes, or red hair, my adoration for all things red is boundless. Actually, I've been contemplating dyeing my hair red again. MAC's Red, Red, Red Collection is/was a gorgeously seductive, well-edited release, with a stunning promotional image that captivates your gaze. I really love everything about the promotional image. 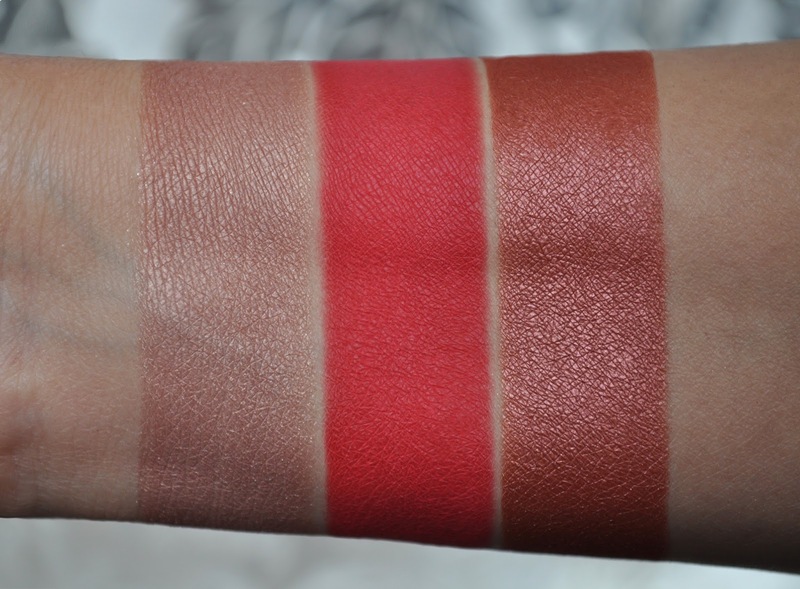 From left to right: Give Me Fire, Strike While Haute, Red Alert Eyeshadow. From left to right: Out for Fun, Secret Admirer, Hot Sensation, 5 Alarm. Aside from Valentine's Day, I've worn the look below four times last week. MAC Studio Fix Fluid SPF 15 in NC25. MAC Sculpting Powder in Bone Beige (to lightly contour). 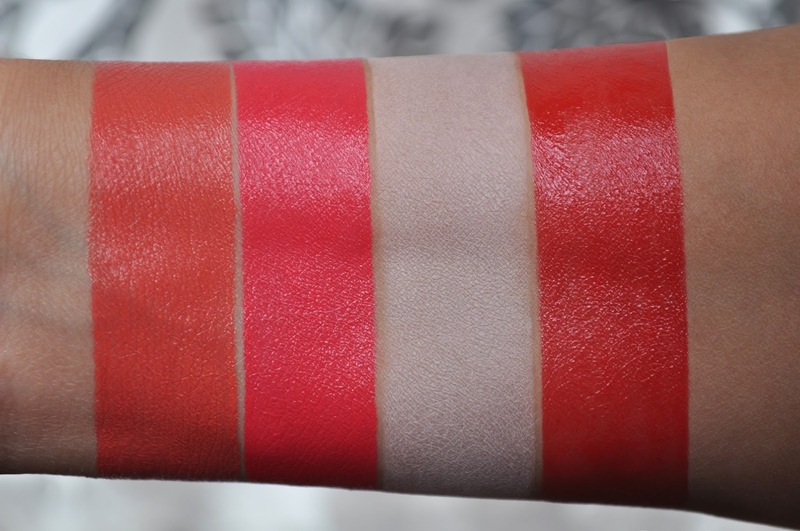 MAC Casual Colours in Secret Admirer (placed in the hollows of the cheeks, blended up and towards the apples of the cheeks). MAC Casual Colours in Out for Fun (on the apples of the cheeks and blended outwards the hair line). 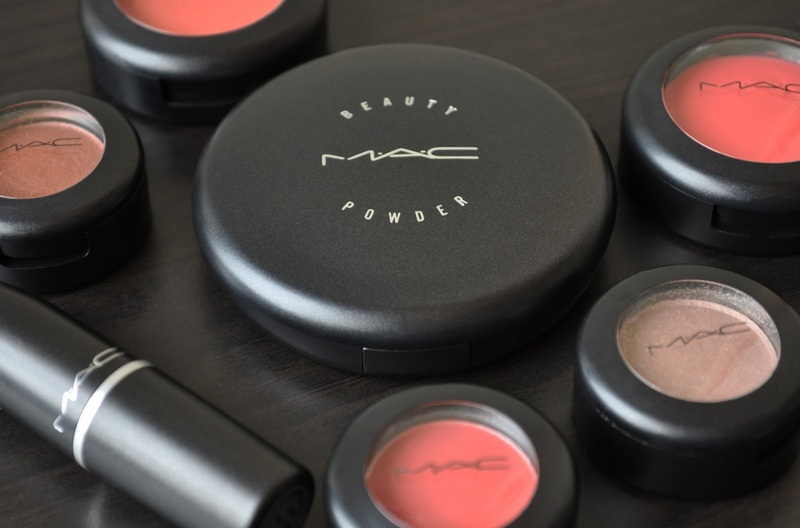 MAC Beauty Powder in Hot Sensation (blended on the forehead, bridge of the nose, under the eyes, cupid's bow, and chin). MAC Eyeshadow in Give Me Fire (on the lid). MAC Eyeshadow in Red Alert (blended into one-third of the outer corner). MAC Eyeshadow in Strike While Haute (in the crease, blended out and extended to a point, and on the lower lashline). MAC Eyeshadow in Sketch (in the outer corner). MAC Studio Chromagraphic Pencil in NW25/NC30 (on the lid as a base, inner corner and waterline). Smashbox Limitless Eye Liner in Onyx (on the lashline and used to tightline). MAC In Extreme Dimension Lash Mascara in Black Extreme (upper and lower lashes). MAC Pro Longwear Lip Pencil in Trust in Red ((used to line and fill in the lips) . 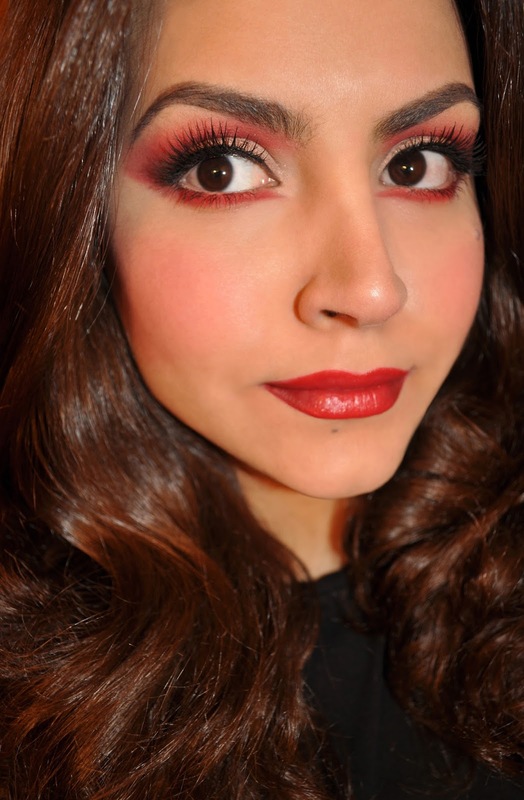 MAC Lip Pencil in Burgundy (used in the corners of the lips and lightly along the inner part of the top and bottom lip). MAC Lipstick in 5 Alarm. From the playfully demure to the fiery seductive, I adore all the variations of reds within the collection. Every single piece in this collection is a little seductress; the eyeshadows have a mesmeric allure (I love their names); the lipstick products deliver an enticing pout; the Casual Colours give an unabashed flush to the cheeks; and, the beauty powder provides the complexion with a coy afterglow. What were your thoughts on MAC's Red, Red, Red Collection? Did you pick anything up? Thank you for commenting Aila! Love your name!